17 councillors voted to back Labour Mayor Catherine Clancy’s plan. Nine voted against. PRESIDENT MICHAEL D Higgins is to be awarded the Freedom of the City of Cork, following a lengthy debate on the issue at this evening’s Council meeting. 17 councillors voted to back Labour Mayor Catherine Clancy’s plan. Nine voted against, and there were two abstentions. “In his position, he’s above politics. I think it’s in proper order that he be recognised by the people of Cork,” Deputy Lord Mayor Emmet O’Halloran told TheJournal.ie. 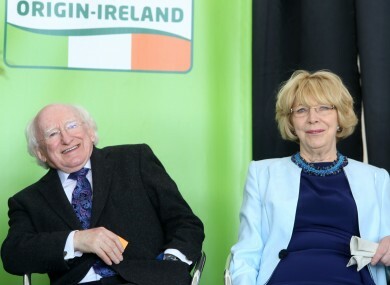 The Fine Gael councillor, who voted in favour of the move, paid tribute to President Higgins’ work in the areas of human rights and the arts, and said he expected the conferral ceremony would take place soon. Six of the nine Irish presidents have been given the award to date — while the names of John Hume, US Senator George Mitchell and President John F Kennedy are also on the ‘roll of honour’. However, some councillors have argued that honour has been ‘watered down’ in recent years. It’s been bestowed on five people since 2010 (by comparison, the ‘Freedom of Dublin’ — handed to Brian O’Driscoll and Fr Peter McVerry at the weekend — has now been given out just eight times since 2002). Fine Gael members of the council want a working group to be set up to decide how the issue should be best handled in years to come. The last five recipients of the honour, since 2010, have been former Fine Gael Tánaiste Peter Barry, GAA star Seán Óg Ó hAilpín, and entertainers Michael Twomey, Frank Duggan and Billa O’Connell (aka. Miah, Cha and Billa). Email “President Higgins to receive 'Freedom of Cork', after Council vote”. Feedback on “President Higgins to receive 'Freedom of Cork', after Council vote”.